We’ve had some nice weather this week, including some colorful sunrises. 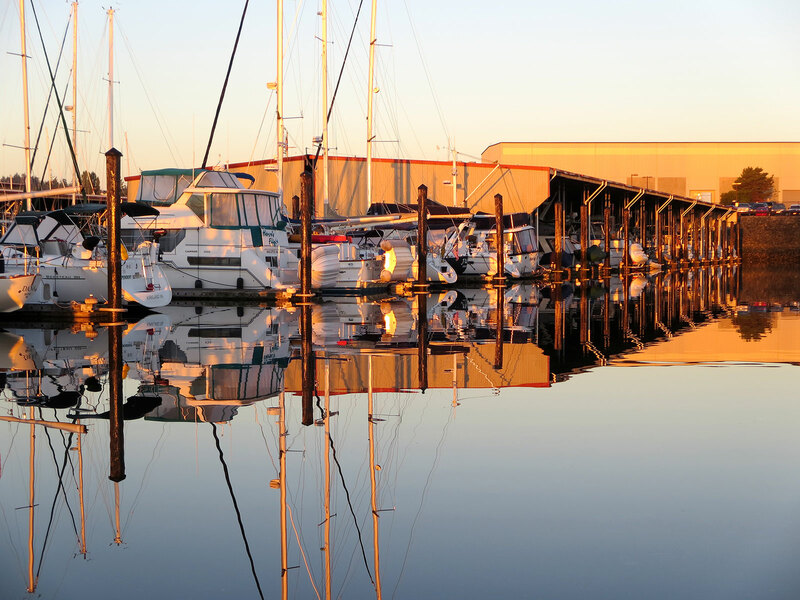 The glow from this sunrise created some wonderful reflections of the boats and boat houses in the calm water at Anacortes Marina. 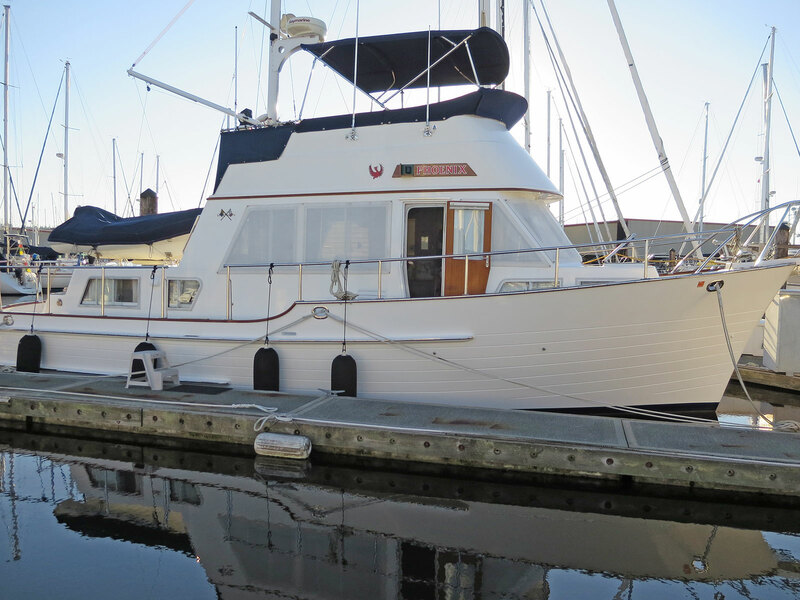 Working on maintenance and projects at our house this summer kept us away from our boat in July and August, when we usually set aside time for exterior boat maintenance—varnishing the teak and waxing the cabin and hull. However, in order to protect the boat over the winter months, we still need to take care of the varnishing and waxing, even though it’s September and the weather will make this work more challenging. So, we packed up the car and headed to Anacortes in the middle of September, hoping for some decent weather. We took a few photos as we drove from our house in Bend, Oregon, to our boat at Anacortes Marina in Anacortes, Washington. 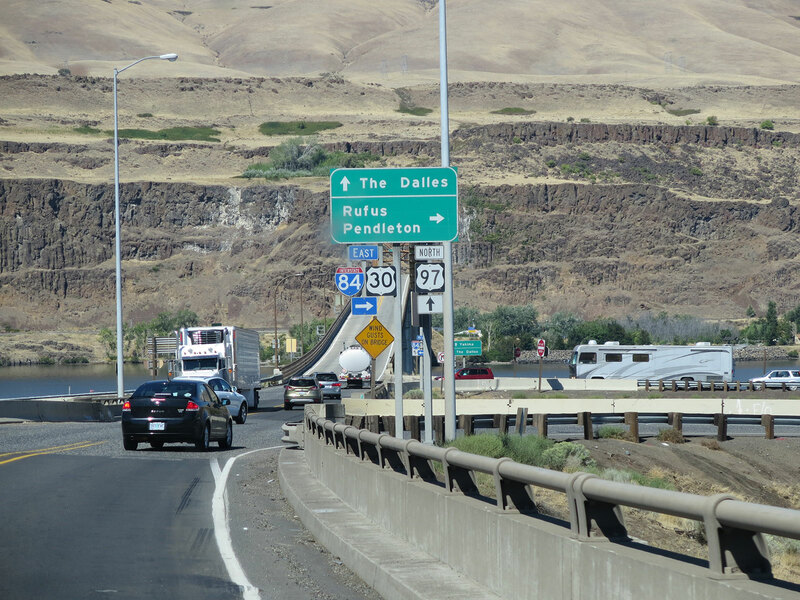 This one was taken at Biggs Junction as we crossed from Oregon into Washington. Welcome to Toppenish! 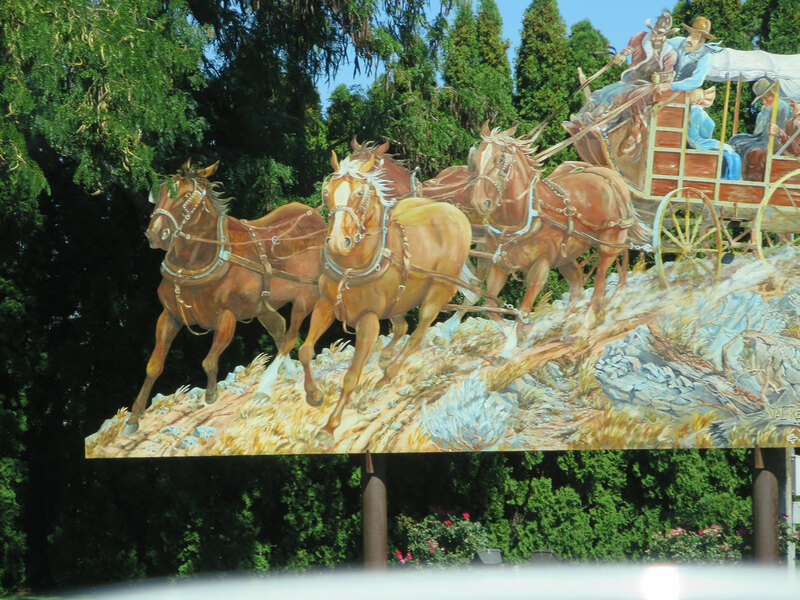 We passed this prominent mural as we enter the town of Toppenish, Washington. 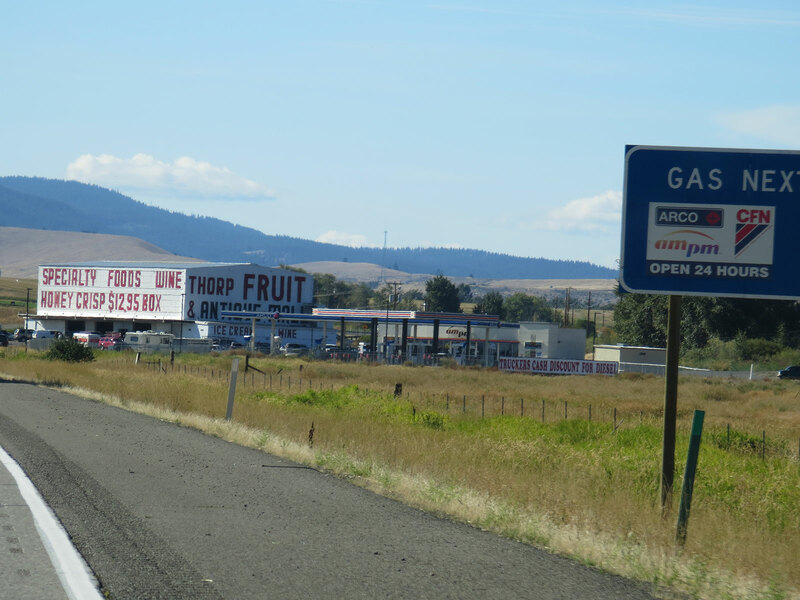 Near Yakima, we passed several fruit stands where fruit from the nearby orchards is available for purchase. Because our drive is so long, we seldom stop at optional things like this, but on other trips we have found there is a great selection of seasonal fruits and other local products at these stands. 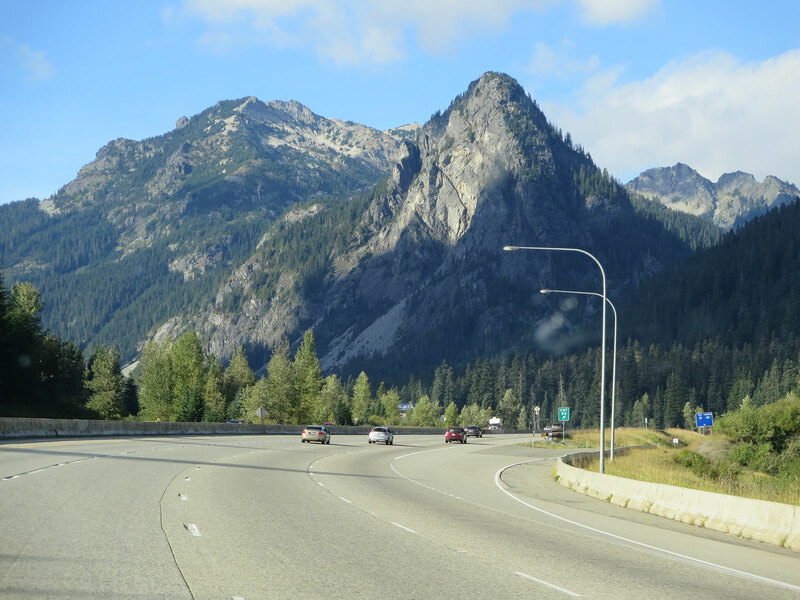 There was no snow on the mountains as we crossed over Snoqualmie Pass. We got lucky with the weather for the first week, as Western Washington experienced a late surge of warm (even hot) summer weather. Varnishing was the higher priority, as the weather is more critical for varnishing. Waxing can be done in between rain showers and when the temperatures are a little cooler. Before we could start varnishing, we had to get the boat cleaned up. So we washed the boat (actually that was the highest priority) the first day after we arrived. Phoenix in our berth at Anacortes Marina sparkling clean after being washed. Next we tackled varnishing the eyebrow, a teak trim piece that wraps around the top of the cabin. We were able to sand, prep, and varnish it all in one day—thanks to some dry thermal weather that kept the afternoon temps in the high 80s. Fortunately we got the varnish on early enough in the day and the heat didn’t affect the finish. Yea! 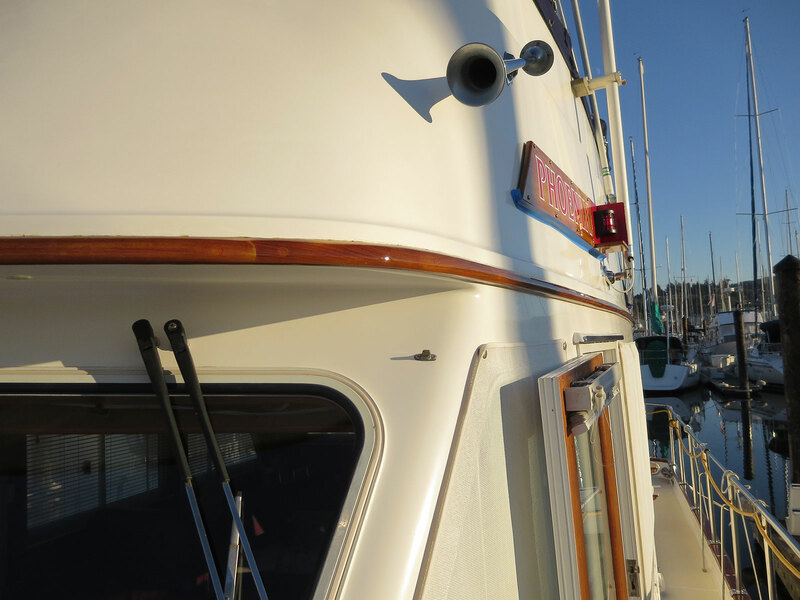 The new coat of varnish sparkles on the teak eyebrow trim, visible just above the windshield on the port side of our boat. Next up was the cap rail. It took us most of a day to do the sanding, and we decided to wash it down good that afternoon so that it would be ready the next day. At this point, the warm weather was starting to break down, and we woke up to thick fog the next morning. The temperature was fairly mild (high 50s) and it was calm. We decided to go ahead with prepping the rail by masking off the top and bottom sides as well as the bases of all the stanchions. With the prep done, we’d be ready to paint as soon as the temperature warmed up and the fog began to lift. So we waited and watched the weather. However, the fog was stubborn, and slow to burn off. We studied the temperature and dew point. The theory is that it’s safe to varnish when enough moisture is out of the air, and that this happens when the temperature is 6 degrees or more higher than the dew point. So as soon as we had a temperature like that, we applied the varnish. The fog never did lift that day, and the varnish dried slowly. However, by today (the next day), the varnish looks great and we can breathe a sigh of relief. The cap rail sparkles with a fresh coat of varnish, even though it was still foggy. This view faces the starboard stern. We usually apply three coats of varnish each summer, and if the weather improves later this month, we’ll try for another coat or two. However, we feel good that we got one good coat of varnish on the exterior teak and that it will be protected through the winter. One morning, the glow of the sunrise shining through the bulkhead at Anacortes Marina created some interesting shadows of the sails and boats. 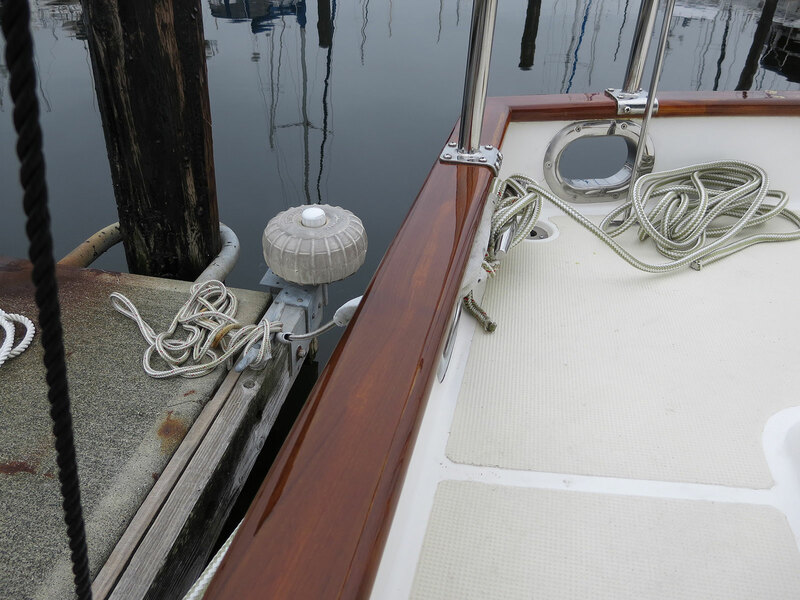 This entry was posted in Life Aboard, Maintenance, Travel and tagged anacortes sunrise, boat maintenance, boat waxing, calm reflections, cap rail, foggy weather, varnishing in fog, varnishing teak by Sailor Lady. Bookmark the permalink. Thanks! Glad you’re continuing to enjoy our blog. We’re sitting in the fog again this morning. Awesome shots! Been unseasonably hot here in Bend. Thanks for the feedback! 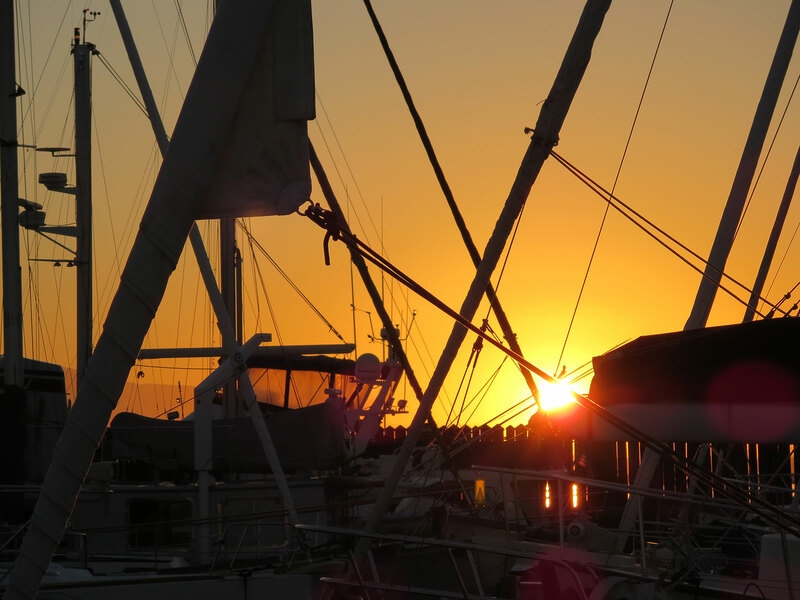 Sunrises at our marina can be striking…sunsets not so much as the western horizon is hidden by the land and shoreside buildings. How about Chris Horner in the Tour of Spain!! What an amazing performance! !